What were your expectations before traveling to Indonesia? Leif Randt: A friend of mine gave me a briefing that boiled down to “gentle people”, “humidity and heat”, “fantastic nature”. Andreas Stichmann: I had no expectations. I didn’t know a lot about Indonesia and tried not to read too much before my trip so that I could be unbiased and just see what would happen. What experiences will you remember particularly well? Leif Randt: When I was on a small island called Leila, near Makassar, a coconut falling down from a tree almost killed me. In Bandung I got lost during a hash-house run. It was already dark and I was convinced that I would have to spend the night in the mountains. The moment when I reached Gili Trawangen and realized that I had left what I thought ‘Indonesia’ was. Suddenly white people with smug faces. The first hours I didn’t like it at all. Andreas Stichmann: The people I met while couch-surfing were the really interesting ones. Driving fast on a motorbike in chaotic traffic conditions and getting through it, was really great. The most memorable discussions I had were about religion. I was surprised how open young Muslims were that I met – you could talk to them about everything and ask them anything. I did spend some time in Iran before and I was used to people being more reserved when it came to religion – although they were very hospitable and open otherwise. How did you perceive the Indonesian literary scene? 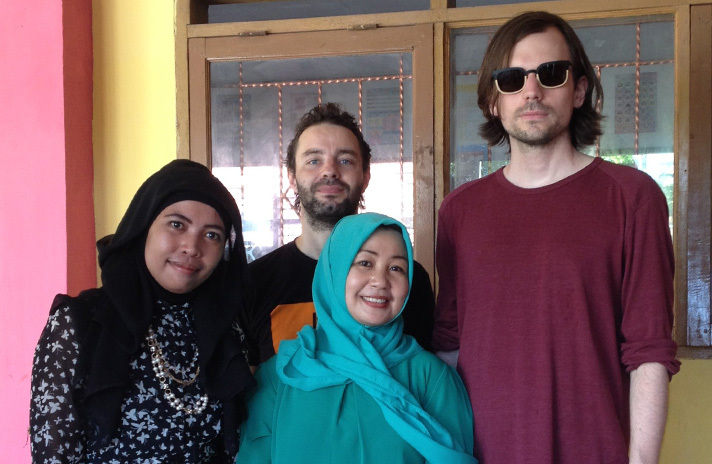 Leif Randt: The festival in Makassar was very charming. In the evening the whole city seemed to be up on its feet to party. Students, who were taking care of the authors, were very motivated and pleasant. Obviously many Indonesians are enthusiastic about literature. However, I didn’t get to know a lot of Indonesian literature while I was there. Andreas Stichmann: The literary events I saw were more focused on performance, commonality and fun – more than in Germany. Social criticism and relevance to present times seemed to have a smaller emphasis. Dancing during readings would also be rather a rare sight in Germany. I did like it a lot though, it seemed more fun and more communal. It was also noticeable that the literary scene is not very big and that not too many books are published. Will we find some Indonesia references in your upcoming projects? Leif Randt: Those who will look close enough will find something. Andreas Stichmann: I can’t say at this stage. The interview was conducted by Katrin Figge.